Cobalt SS Network - GM STAGE KITs FAQs - Read Me First! This thread is intended to organize all the information that's floating around the 2.0L Technical section about the GM staged Kits. Please only post FAQs (conclusive information) about the kits. Provide supportive material and documentation if you can for each bit of information you contrubite. This is not a thread to ask questions. Any posts other than information will be deleted. Hopefully this will help. Thanks everybody! The lean code P0171 hasn't popped up yet so we'll see. The stumbling idle when blipping the throttle at a stop is gone. The idle is raised slightly to about 875 RPM. Car feels more tuned but still has the feel that we fell in love with. First gear has been proven already with a Tech2 scan. 2nd/3rd/4th/5th gears have not. Can someone please verify this also with a tech2? I was told otherwise and that 1st gear was only changed due to less engine load. im gonna say its fun all the way around..i saw on another thread that when in low rpm and u step on it..boost automatically goes to 12.5 and higher rpm goes to like 15/16...i cant wait for mine!! Q: What is the pulley size for stage 2? Is the reflash available with out purchasing the entire kit. I'm sure alot of us have already changed out the pulley and the injectors. If so how do we go about doing it? Q:Is the reflash available without getting the stage kits? A: NO, an authorization number is on the instruction manual that is needed by the GM tech doing the reflash to allow him to get the proper reflash part number loaded into the tech 2. With the 3.0 pulley (GM) can we go smaller than that, without changing the hub or snout? Q:With the 3.0 pulley (GM) can we go smaller than that, without changing the hub or snout? A:Yes the Stage 2 Kit pulley is a modular design that is held on with 4 bolts. 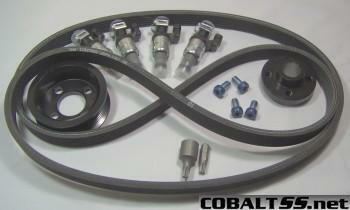 At this time it is not proven if a current aftermarket pulley will bolt to the stock GM Kit Hub. A(cont): If some-one starts to make 4 bolt pulleys for the hub. Looking at other designs (ZZP and Billetflow which are both 5 bolt) it is not possible to re-use the hub YET. 2)What kinda of MPG are you guys looking at currently at with the stage 2 upgrade. If you have your dealer's parts department call the PARTEC hotline, they'll find the listed time for Stage 1 is 1.0 hours, and Stage 2 is 1.5 hours. If the dealer is doing this for the first time, you may have to work with them on it. These numbers do not show up on gmpartsdirect.com. The Hub assembly does not have any parts numbers on it. Dealer install on stage 2 appears to be between 2.5-3 hours. It takes awhile on the phone to get the VCI or whatever its called. Mine took 3 hours (tech took it for a drive in that time too). with Stage 2.. if we went down to a smaller pulley (such as 2.9 for ex.) would we still have to run the boost bypass mod? I believe that is correct....but i could be wrong....! Yea, the recently published PARTEC time for Stage 2 is rediculous. The prima donna front line drivability techs that are best suited and trained to do this type of work will just refuse to do it for 1.5 (since the warranty flat-rate for the same operations is more than DOUBLE that) So then the job will just end up getting dispatched to a back-shop "Bubba" that's never opened the hood on an LSJ- So he CANT WAIT to do a Before/After roadtest your prize ride and very likely get axle grease all over your seats and doors! Whoever developed the op-time for the Stage 2 messed up IMO- THIS ISNT A SET OF RUNNING BOARDS! All it does is promote the tech to RUSH through the installation and potentially make mistakes and/or cause damage. Total BS! Partec reps are gonna get an earful!! Shouldn't the Chevy dealers have one? What if someone brought in their Supercharged Monte Carlo SS 3800 Series V-6? The supercharger pulleys ARE NOT servicable under "regular" GM service practises. So NO there isnt one as part of their regular tool inventory.